Mr. Barr is required only to provide lawmakers with very basic facts. He would be operating within the guidelines of the regulation if he were to give Congress a bare-bones notification that Mr. Mueller had concluded his work. 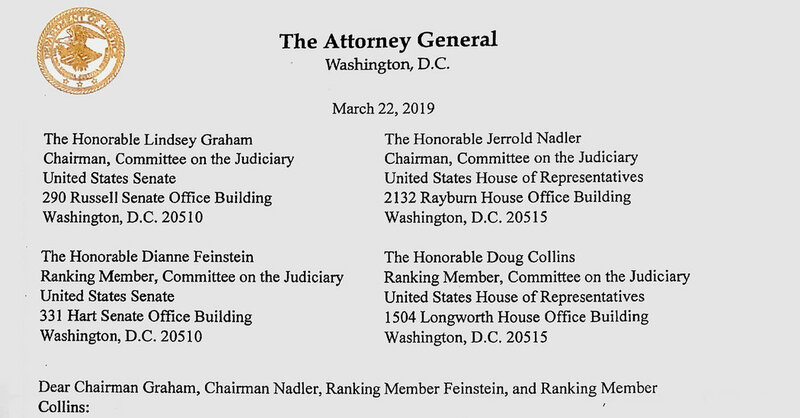 In his letter on Friday, Mr. Barr said he planned to consult with the deputy attorney general, Rod J. Rosenstein, and Mr. Mueller about what other details from the report can be given to Congress and the public. Will Congress accept a bare-bones report? First, collusion has no legal definition, though it has become a term of art as a shorthand reference to the Russia investigation. A key question in the special counsel investigation concerns whether Mr. Trump or his campaign was coordinating with Russia to try to affect the outcome of the 2016 presidential election. If Mr. Mueller’s investigation ends without charging Mr. Trump or his aides with conspiracy, some may interpret that to be a “no collusion” finding.